Thought without symbols — life without language — it’s a cognitive reality that is virtually impossible for most modern humans to fathom. For the vast majority of us, our thought processes have been profoundly shaped by the introjection of language into our cognitive worlds, the taking on board of a massive intellectual prosthesis, the collective product of countless generations. Human thought, for the majority, is not simply the individual outcome of our evolved neural architecture, but also the result of our borrowing of the immense symbolic and intellectual resources available in language. What would human thought be like without language? 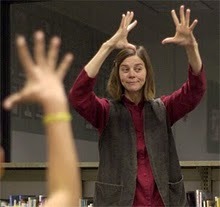 In the interview, Schaller describes how she originally became fascinated with sign language, when she happened into the very first lectures held in sign language by Lou Fant in 1972 in a course called ‘Visual Poetry.’ Hit by a catering truck near the end of high school, Schaller had been excused from her classes so she took the opportunity to sneak into college classes that sounded interesting at Cal State Northridge. She was so moved by what she saw that she wound up joining a volunteer signing drama group even though, as she puts it, she knew three signs when she signed up. I went to the door to walk out and was actually turning the handle to leave, when I see this man who looked so frightened. He was holding himself as if he were wearing a straightjacket. He was backed up in a corner, protecting himself. I saw that he was studying mouths, he was studying people. Even though he was frightened, he was still watching: what is happening, what is happening? I walked up to him and signed, “Hello. My name is Susan.” He tried to copy that and did a sloppy rendition of “Hello, my name is Susan.” Obviously he didn’t know what he was doing. It wasn’t language. And I was shocked. He looked Mayan and I thought, well, if he knew Mexican sign language, he wouldn’t try to copy. That’s not a normal thing to do, even if you don’t know the language. I couldn’t walk away. I slowly figured out that this man had no language. As I said, I could see that he was very intelligent. I could see he was trying very hard. I was twenty-two years old. I had no idea of what I was doing. I was faced with how to communicate the idea of language to someone without language. He’d just try to form signs and copy what I was doing. But his facial expression was always, is this what I’m supposed to do? That question was on his face all of the time. It was terribly frustrating. It went on hour after hour, for days and days and days. Then I had an idea. If I died tonight, I may have had only one truly brilliant thought in my life. What was it that attracted me to this man? His intelligence and his studiousness, the fact he was still trying to figure things out-those two things. I decided to stop talking to him. Instead, I taught an invisible student. I set up a chair, and I started being the teacher to an invisible student in an empty chair. Then I became the student. I would get into the other chair and the student would answer the teacher. I did this over and over and over. And I ignored him. I stopped looking at him.